Publish 26-11-2018: Original Draft modified full Cicada 3301 disclosure discouraged, not specifically barred from posting image or "WORKING NOTES". We are modifying the information posted as requested. Please review strategies AND PATHING as necessary. Fill in gaps through self-attrition. IN NO PARTICULAR ORDER, at times they reveal a certain path in a logical order, others you may have to connect the dots. Good luck! Cicada 3301 first message is surprisingly MEMO-like. 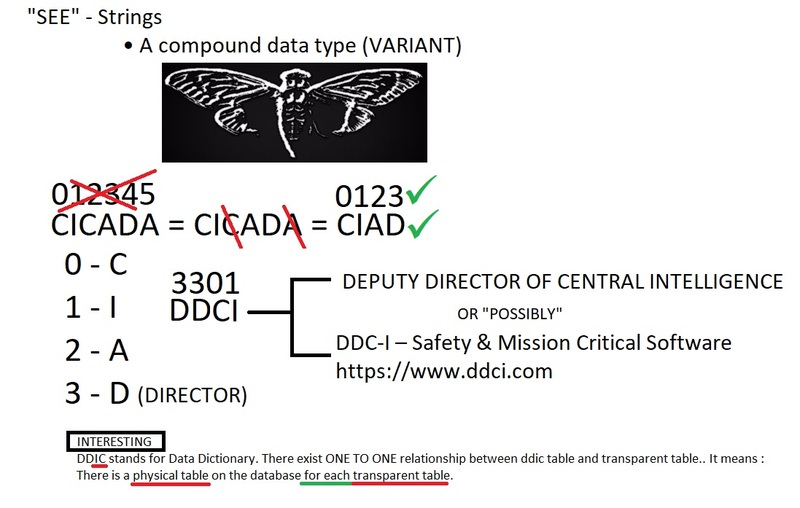 Google query: What is the DDCI? Under DCI is the deputy director of Central Intelligence (DDCI), who assists DCI as head of the CIA and of the Intelligence Community. Sidenote: READ the articles. The NSA was out of control way back in 1977. We started with the obvious and searched for ddci- and got nothing. VIAF Screenshot 2012 Screenshot 2012 Acronym	VIAF Introduced	August 6, 2003 Managing organisation	OCLC Example	106965171 Website	viaf.org The Virtual International Authority File (VIAF) is an international authority file. It is a joint project of several national libraries and operated by the Online Computer Library Center. Patience is a virtue is a proverbial phrase referring to one of the seven heavenly virtues typically said to date back to "Psychomachia," an epic poem written in the fifth century. Background: The first known recording of this expression is in Piers Plowman, a narrative poem believed to have been written by William Langland between 1360 and 1387. It is similar to the Latin expression, maxima enim, patientia virtus (patience is the greatest virtue). perform search of william langland - results that include piers plowman (there is multiple to investigate, what about other personal records?) https://viaf.org/viaf/61560236/#Langland,_William,_1330?-1400? Important: "One text of the Piers Plowman poems is found in the Bodleian Library's Rawlinson Poetry MS 137. This manuscript presents an important witness to the A version, and it is on that text that the present edition is based"--Text. you can also search william langland directly in the VIAF and you will see that there is MORE than ONE VERSION OF THE TEXT. Is there a better place to hide things than IN PLAIN SIGHT? You will face a trial in which you cannot gain access without the answer to a question. All answers are accepted, BUT ONLY THE CORRECT ANSWER will grant you ACCESS to the proper channel. This query was explored by the New York Times journalist Michael Pollak in an article that was part of an ongoing series answering questions about the megacity New York [NYGT]. Top researcher Barry Popik and QI were able to help Pollak respond successfully to this query, and he kindly acknowledged our aid. It is not clear whether Wynn originated the quip since his newspaper column contained many older jokes. For example, the two other jokes listed above had already appeared in print. She told me the other day she was sure Danny was going to be a doctor. She bases her hopes on the questions that Danny asks. How do you know you haven’t got a gizzard? How would you like to be ripped clean up the back? and Where does your lap go to when you stand up? What great general was buried in Grant’s tomb? 8.—Who said, “Give me liberty or give me death,” Benjamin Franklin, Barbara Frietche, or Patrick Henry? In conclusion, the question about the contents of Grant’s tomb was being asked before Groucho’s show “You Bet Your Life” hit the airwaves. QI thinks the quip probably predated 1925 when Ed Wynn published a version in his column. Here is link to the New York Times article on this subject, and here is a link to Barry Popik’s discussion which includes some additional citations. http://id.loc.gov/authorities/names/n84120212.html - quite the busy bees. Are you solving the mystery of the new technological society? They not only need the smartest to save themselves but to save us ALL. ...Did they actually open PANDORA'S BOX? Open your mind... IT'S ALL AROUND YOU. They changed the rules once, too...Tricky!